Recently new aspects of the immunopathology of Chagas disease have been described in patients infected with HIV and unusual clinical manifestations such as cutaneous lesions, involvement of central nervous system and/or serious cardiac lesions related to the reactivation of the parasite have been reported. Two uncloned Trypanosoma cruzi strains previously isolated from chronic chagasic patients with HIV co-infection were studied in order to evaluate the impact of the immunosuppression on the genetic diversity of the parasite. We have exploited an experimental model to determine whether genetically distinct populations appear after immunosuppression as a consequence of in vivo selection or in vitro propagation. The in vitro and in vivo conditions have allowed us to study the selected populations. The first strain was isolated from a case of reactivation of Chagas disease in a patient which presented four cerebral lesions. It was possible to demonstrate that the patient was infected with at least three distinct populations of T. cruzi. The population, recovered after immunosuppression, in mice was genetically divergent from the primary human isolate. The second strain, isolated from a hemophiliac/HIV positive patient presenting cardiac manifestation of Chagas disease showed no marked genetic difference after experimental immunosuppression. The immunological condition of the patient, associated or not to the reactivation of the infection, and also the strain of the parasite may have an important role during the course of the disease. The in vivo mechanism that generates parasite genetic variability or the participation of the selection under stress conditions will require further investigation. Chagas disease is a zoonosis widely spread in Central and South America affecting 18 million people in 21 endemic countries. Approximately 100 million people are exposed to the risk of infection which corresponds to 25% of all Latin American inhabitants [1, 2]. Trypanosoma cruzi, the etiologic agent of Chagas disease, is composed of a set of heterogeneous populations presenting a remarkable degree of intra-specific heterogeneity. The circulation of such populations in domestic and sylvatic cycles involve humans, vectors and animal reservoirs. Initial studies using isoenzymatic analysis revealed three major zymodemes: Z1 and Z3 (found in the sylvatic cycle) and Z2 in domestic environments . Subsequently the zymodeme diversity among distinct clones was found indicating that they could hardly be clustered in a few groups . In recent years the committee of the "International symposium on the advances in knowledge of Chagas disease 90 years after its discovery"  decided to classify T. cruzi isolates in two groups: T. cruzi I associated with the sylvatic cycle and T. cruzi II with the domestic cycle. This intra-specific heterogeneity has also been demonstrated by different genotypic and phenotypic markers, confirming the multiclonal structure of T. cruzi populations [6–8], probably having important clinical and epidemiological impact. As a consequence people living in endemic areas are frequently exposed to independent multiple infection, constantly leading to an accumulation of genetic endogenous variability [9, 10] that contributes to the polyclonality of primary T. cruzi isolates. Recently new aspects of the immunopathology of Chagas disease have been described in patients infected with HIV. Patients with Chagas disease/ HIV co-infection may present unusual clinical manifestations such as cutaneous lesions, involvement of central nervous system and/or serious cardiac lesions related to the reactivation of the infection [11–14]. The process of reactivation opens an interesting field to investigate the genetic variability of T. cruzi populations under immunosuppression circumstances. Pacheco et al. reported the genotypic and phenotypic typing of a strain isolated from a case of Chagas disease reactivation associated with AIDS in a patient presenting involvement of the central nervous system. Based on the severity of this case, we decided to further analyze the previously isolated strain investigating the genetic characteristics of the parasite before and after immunosuppression in mice. The present paper also reports the study of a second T. cruzi strain isolated from a hemophiliac patient suffering from Chagas disease/HIV co-infection, in order to estimate the impact of the immunosuppression on the genetic diversity of both isolates. Patient 1: chronic chagasic/ HIV positive patient, from Minas Gerais State, Brazil, presenting indeterminate form acquired from natural transmission before the HIV infection. The CD4 lymphocyte count was 102 mm3, when the patient died of intracranial hemorrhage . Patient 2: hemophiliac/ HIV positive patient from Bahia State, Brazil, manifesting cardiac form of Chagas disease acquired from natural transmission. The CD4 lymphocyte count was higher than 500 mm3 . Four T. cruzi reference strains: representing the major zymodeme groups : Z1 – Dm28c and Colombian (T. cruzi I), Z2 – CL strain, Z2b – Y strain (T. cruzi II) were used as control in the molecular typing. The two T. cruzi strains from Chagas disease/HIV co-infection human cases were prior isolated by xenodiagnosis and propagated in biphasic cultures (Novy-Nicolle-McNeal – NNN/ Brain Heart Infusion-BHI/ 10% Fetal Bovine Serum, complemented with 20 mg/ml ampicillin, 0.1 mg/ml streptomycin and 100 U/ml penicillin at 28°C. The parasite growth was accompanied during five passages. The cell mass was prepared and the parasites characterized by molecular markers according to protocols previously described [18–20]. Concomitantly, groups of ten male Swiss mice weighting 8–10 g were inoculated, intraperitoneally, with culture forms and examined through fresh blood slides after 20 days. Mice, presenting patent parasitemia, were maintained through passages with 104 bloodstream trypomastigotes, on the 21st day of infection for five months. After passage in mice, both strains were re-isolated in biphasic cultures (without antibiotics) at 28°C with serial passages on the 21st day. The primary isolates were kept in culture for twelve months and cryopreserved in liquid nitrogen. In the chronic phase of the disease (six months of infection), mice were immunosuppressed with 50 mg of cyclophosphamide per kg of body weight for eighteen consecutive days . After immunosuppression parasites were recovered from the blood and characterized using molecular approaches. The experiments in mice were conducted using a protocol approved by the Center for Biological Evaluation and Care of Research Animals (CEUA-FIOCRUZ, Program n° P0067-00) and in accordance with the code of ethics of the Brazilian College of Animal Experimentation (COBEA). T. cruzi populations obtained from in vivo and in vitro conditions were compared with the primary uncloned isolates. The cell mass was prepared washing the parasites twice by centrifugation at 700 × g in SE buffer (0.15 M NaCl / 0.1 M EDTA, pH 8,0) for 10 min at 4°C. The cell mass was stored at -70°C before being used for multilocus enzyme electrophoresis and kDNA analyses. 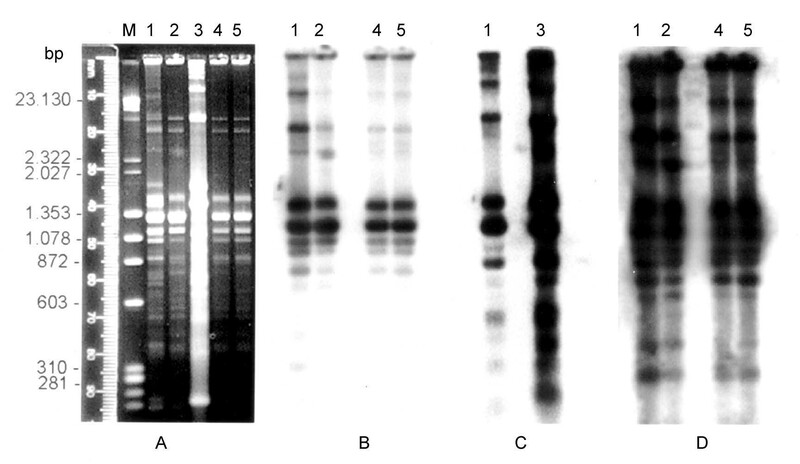 Isoenzymatic analyses were performed on 1% agarose gel according to protocols previously described [17, 20]. The following nine enzymes were used: glucose 6 phosphate dehydrogenase (G6PDH; E.C. 1.1.49), glucose phosphate isomerase (GPI; E.C.5.3.1.9), isocitrate dehydrogenase (IDH; E.C. 1.1.1.42), malate dehydrogenase (MDH; E.C.1.1.1.37), malic enzyme (ME; E.C.1.1.1.40), nucleotidase (NH, E.C.3.2.2.1), peptidase D (PEP-D, E.C.3.4.13.9), 6-phosphogluconate dehydrogenase (6PG; E.C. 1.1.44), phosphoglucomutase (PGM; E.C.2.7.5.1). 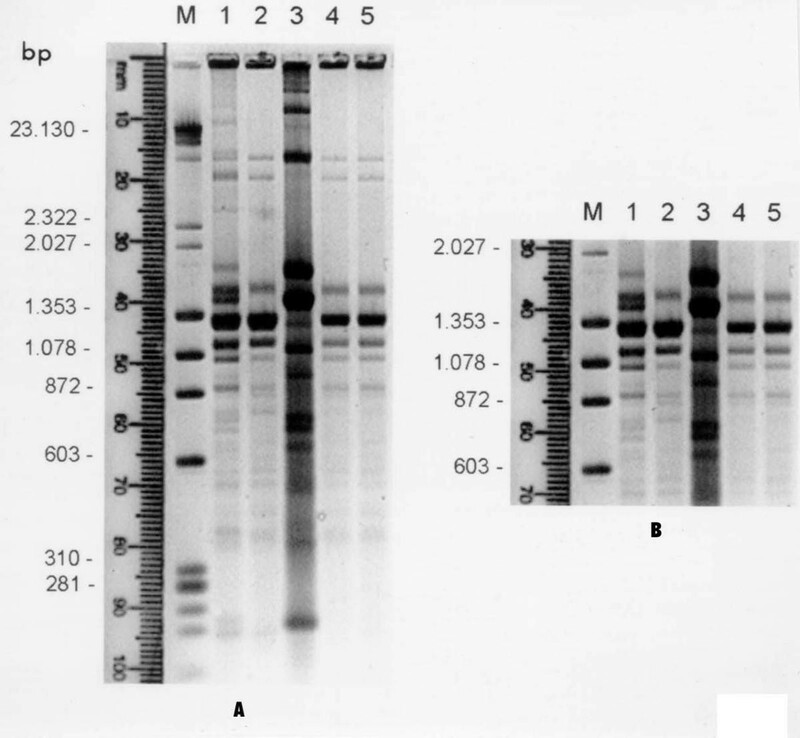 The kDNA extraction and restriction enzyme analyses were carried out according to the methodology previously described [18, 19]. Approximately 1 μg of purified kDNA was digested by the restriction enzymes Hinf-I at 37°C for 3 hrs in the appropriate buffer. kDNA fragments (maxi and minicircles) were separated through electrophoresis in 1.5% agarose gel in TBE buffer (0.89 M Tris-base; 0.89 M boric acid; 0.024 M EDTA). The electrophoretic pattern was visualized under UV light after ethidium bromide staining. Fragments of kDNA were transferred to a nylon membrane according to Southern , the gel having previously been denatured in 1.5 M NaCl/0.5 M NaOH and neutralized in 1 M Tris-HCl pH 8.0. Each step was carried out during 30 min with mild stirring. The total kDNA from primary isolate of Patient 1, named as kDNA profile I and populations recovered from in vivo (kDNA profile II) and in vitro conditions (kDNA profile III) were radiolabeled with α32 P dATP by the random primer reaction  and used as probes. After hybridization, the filters were washed three times during 30 min in 0.1x SSC/ 0.5% SDS at 60°C. Autoradiography was performed using X-ray film (Kodak X-OMAT) at -70°C overnight. The isoenzymatic profiles were compared using Simple Matching (SM) coefficient of similarity to determine the proportion of mismatched bands. The matrix was transformed into a dendrogram by the UPGMA (unweighted pair-group method with arithmetic averages) algorithm  using NTSYS program (version 2.0, Exeter Software, 100 North Country Rd, Setauket, NY). The primary isolates from both patients were prior characterized by MLEE and restriction analyses of kDNA revealing distinct zymodemes and kDNA restriction profiles. Numerical analysis based on patterns generated by nine enzymatic systems has allowed the division of the strains into two clusters separated by a coefficient of similarity of 0.73. The first cluster was formed by the strain isolated from Patient 1 and T. cruzi strains representative of domestic zymodemes (Z2) sharing different coefficients of similarity (from 0.82 to 0.94). No T. cruzi strains analyzed was found to be 100% similar (SM = 1). The strain isolated from Patient 1 was identified as isoenzymatic variant of the reference strains (CL and Y) associated with the domestic cycle (Z2). The sylvatic Z1 zymodeme (represented by the T. cruzi strains Dm28c and Colombian) was included in the second cluster sharing approximately 85% of common characteristics. The strain from Patient 2, considered the most differentiated, was linked to the two main clusters by a coefficient of 0.60 (Fig. 1). The isoenzymatic pattern observed for such strain was compatible with strains belonging to sylvatic zymodemes in four (PGM, GPI, PEP-D and 6PG) out of the nine enzymes tested. Dendrogram showing the Simple Matching Coefficient (SM) of similarity based on isoenzymatic profiles of the T. cruzi strains from Chagas disease/HIV co-infection patients and comparison with other different T. cruzi strains. Patient 1; B-T. cruzi isolated from a chronic chagasic patient, Y-prototype of Z2b (Y strain), CL-prototype of Z2 (CL strain), E-T. cruzi isolated from vector, Dm28c and Colombian strains-prototypes of Z1, Patient 2. Hinf-I restriction analysis of kDNA has demonstrated the presence of three different genotypic profiles when the primary isolate from Patient 1 (kDNA profile I) and parasite populations from in vivo (kDNA profile II) and in vitro (kDNA profile III) conditions were compared. In fact three different parasite subpopulations were selected from Patient 1 (Fig. 2A, lanes 1, 2 and 3). The genotypic profiles of the populations that emerged in vivo and in vitro were distinct. However, only one genetic pattern was detected after immunosuppression in mice, independent of the initial inoculum (Fig. 2A, lanes 4 and 5). In figure 2B the region of minicircle fragments ranging from 600 to 1500 bp was amplified to better visualize the kDNA polymorphisms. Polymorphisms were not detected in kDNA fragments of the parasite isolated from Patient 2, before and after immunosuppression (not shown). Agarose gel electrophoresis showing Hinf-I kDNA restriction profiles of T. cruzi isolated from patient 1 and populations recovered in vivo and in vitro. A) M-DNA marker: λ Hind II/ox Hae III, 1-kDNA profile I, 2-kDNA profile II, 3-kDNA profile III, 4–5-T. cruzi populations recovered after passage in immunosuppressed mice (kDNA profile II); B) enlarged photograph of kDNA minicircle regions showing the heterogeneity in fragments ranging from 600 to 1500 bp. The genotypic differences observed in the kDNA restriction profiles (kDNA profiles I, II and III) were also evaluated in cross hybridization experiments using the same kDNA profiles as homologous probes (Fig. 3). When kDNA profile I (Patient 1) was used as probe, a strong sequence homology with the homologous kDNA and with sequence from profile II populations was detected (Fig. 3B, lanes 1 and 2). However an absence of cross-homology with kDNA from in vitro populations (profile III) was perceived (Fig. 3B, lane 3). Curiously, the probe prepared from kDNA profile III only hybridizes with its homologous sequences and with those from kDNA profile I (Fig. 3C, lanes 1 and 3). Interestingly the kDNA probe prepared from parasites recovered after passage in immunosuppressed mice (kDNA profile II) did not recognize homologous sequences in kDNA profile III (Fig. 3D, lane 3). Southern blot hybridization with homologous kDNA probes and corresponding autoradiographies. A) Agarose gel electrophoresis showing Hinf-I kDNA restriction profiles: M-DNA marker: λ Hind II/ox Hae III, 1-kDNA profile I, 2-kDNA profile II, 3-kDNA profile III, 4–5-T. cruzi populations after passage in immunosuppressed mice (kDNA profile II). B) autoradiography after hybridization with kDNA profile I used as probe. C) autoradiography after hybridization with kDNA profile III as probe. (D) autoradiography after probing with kDNA profile II. Analysis of nine enzymatic systems (G6P, GPI, IDH, MDH, ME, NH, PEP-D, 6PG, PGM) revealed no evident isoenzymatic variation among the primary isolate from Patient 1 and populations recovered after passage in immunosuppressed mice. Distinct isoenzymatic variation was observed in T. cruzi populations from in vitro conditions. The primary isolate from Patient 2 and parasites isolated after passage in immunosuppressed mice displayed identical isoenzymatic patterns (not shown). By using different molecular markers it was possible to identify taxonomically, at species level, the primary isolates. Different zymodemes belonging to domestic and sylvatic cycles as well as distinct kDNA restriction profiles were also observed in the strains analyzed. In addition a synthetic oligonucleotide specific for the subgenus Schizotrypanum  was used as probe to confirm the characterization of the primary isolates as T. (S..) cruzi (not shown). The primary isolate of Patient 1 was typed as a variant of the zymodeme 2. In this patient the reactivation of the disease was observed. The CD4 lymphocyte counts remained under 200 cells/mm3 during one year demonstrating the severity of the immunosuppression. The other patient (Patient 2), presenting cardiac manifestation of chronic Chagas disease, showed no clinical and parasitological evidence of reactivation at the moment of the strain isolation . The primary isolate of this patient, although presenting a more divergent isoenzymatic pattern was considered as belonging to sylvatic zymodemes. The primary isolate from Patient 1 was composed at least by three distinct populations indicating the polyclonality of the initial infection and selection of subpopulations under experimental conditions. Mixed infections with distinct populations of T. cruzi in natural human infections [26, 27] and in triatomine vectors  have been reported in literature. As well as, cloned populations in T. cruzi and Leishmania parasites have shown evidence of heterogeneity [29, 30]. In the present work selective pressures acting on the parasite could have induced a variation in the kDNA minicircle classes. The observed genetic variability occurred when a unique genotypic profile was observed in vivo (kDNA profile II) independent of the initial inoculum. Such variability might reflect a shift in specific classes of minicircles  or alternatively, an endogeneous generation of new polymorphisms . Corroborating to such hypothesis cross-hybridizations using homologous probes (kDNA profile I and II) revealed strong sequence homology indicating a close-genetic relationship. Although kDNA profile III was the most differentiated, homologous sequences were also present in the kDNA from the primary human isolate (kDNA profile I). Such observation indicates that these sequences are present in the kDNA of the parental strain, or alternatively, parasite populations belonging to kDNA profile III are present in a low percentage in the whole initial population. Conversely, the absence of cross-hybridization could also indicate the possibility of specific minicircle classes being present in different percentages in the two T. cruzi subpopulations. Isoenzymatic analysis also confirmed the distinctiveness of the subpopulation selected in vitro. Probably the three observed profiles do represent populations of varying composition. Further clonal analysis of such populations will possibly solve this question. The genetic diversity observed in these populations or the emergence of minor parasite subpopulations, as a consequence of selection, can be regarded as a way of conferring selective advantages to the parasite. Reinforcing this argument, it was recently reported the presence of certain phenotypic patterns of parasites isolated from HIV positive patients . The authors addressed the possibility that the immune system could select virulent from avirulent populations. In the present work, only one genetic profile (kDNA profile II) was observed in mice. This finding suggests that the selected population is probably more adapted to the stress conditions in vivo. In fact, the emergence of the kDNA profile II after inoculation in vivo of populations from profile III corroborates such a statement. As in the second strain (Patient 2) no marked genetic difference was observed before and after immunosuppression in mice, a strain-dependent phenomenon can also be a plausible explanation. The fact that T. cruzi strains react differently to the immunosuppressive effect of cyclophosphamide  may perhaps sustain such supposition. The biological and genetic heterogeneity of circulating strains of T. cruzi can make it difficult to interpret the different manifestations of the disease and also to make correlation between strains and specific clinical traits. However, different T. cruzi strains have been shown to be involved in pathologies of the autonomic nervous system in mice . On the other hand, it was also reported that the reactivation of Chagas disease in HIV positive patients was not correlated with a particular T. cruzi genotype . As final remarks, it is reasonable to suppose that the immunological condition of the patient, associated or not to the reactivation of the infection, and also the strain of the parasite may have an important role during the course of the disease. The in vivo mechanism that generates parasite genetic variability or the participation of the selection under stress conditions will require further investigation. This work received financial support from The International Atomic Energy Agency (IAEA, Vienna, Austria). Brito CMM prepared the experimental design, carried out the molecular characterization, data analyses and drafted the manuscript. Pires MQ participated in the molecular hybridization. Pacheco RS conceived of the study, carried out the data analyses and participated in its design and coordination. All authors read and approved the final manuscript.